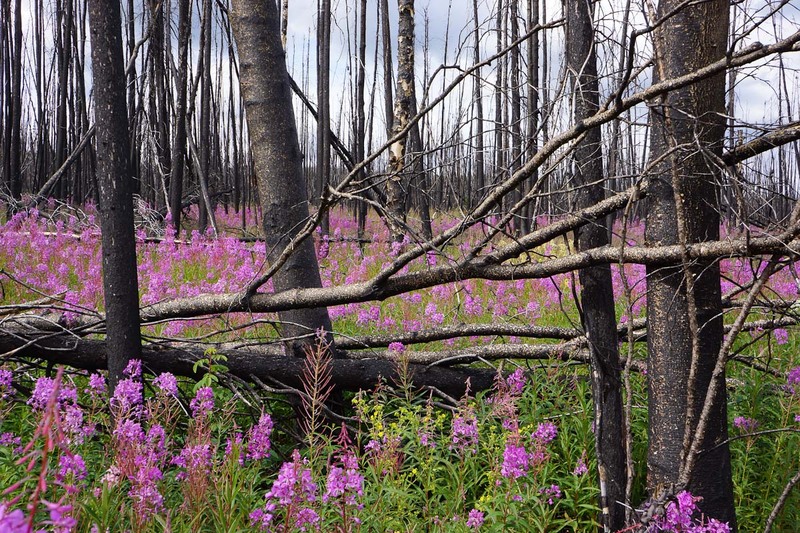 The increasing number of fires in Alaska and the possible connection to climate change has been a hot topic in Alaska for several years now, especially during the huge fire seasons of 2004-2005 and the more recent very hot early fires of 2010. This year, though, the weather turned quickly wet and cold in June, and the fire season petered out rather quickly in Alaska. The other fast moving topic is me—I’ve moved out of Alaska—a fast move that was a long time coming—I’ve spent 25 years in Alaska, I’m now 55, and the long winters have become oppressive, not just for me, but for my family. The cold streak of last winter may have been the last straw—I know many long term Alaskans who thought that the winter of 2011-12 was one of the hardest ever—and my whole family rebelled at the thought of another winter like that one. This summer, we spent time on our property in northern Washington, and visited a few other places in Oregon and Washington—but elected to move to Spokane, partly for a good school for our son, and partly because Spokane is within easy weekend commuting distance from our farm. Shortly after arriving in Spokane—I planned a day looking for apartments—I had a list of five apartment complexes to look at—one of the first questions asked was when I needed the apartment—my response was always “tonight”—only half in jest—I was willing to spend a few nights in a hotel until an apartment opened up, but the fewer the better—and one place had an apartment almost ready—when we walked in, the view through the apartment was into a meadow with cows—and I knew I was home—at least for now. While waiting for our credit check to clear, we drove into the country just beyond the city limits, and immediately saw smoke. 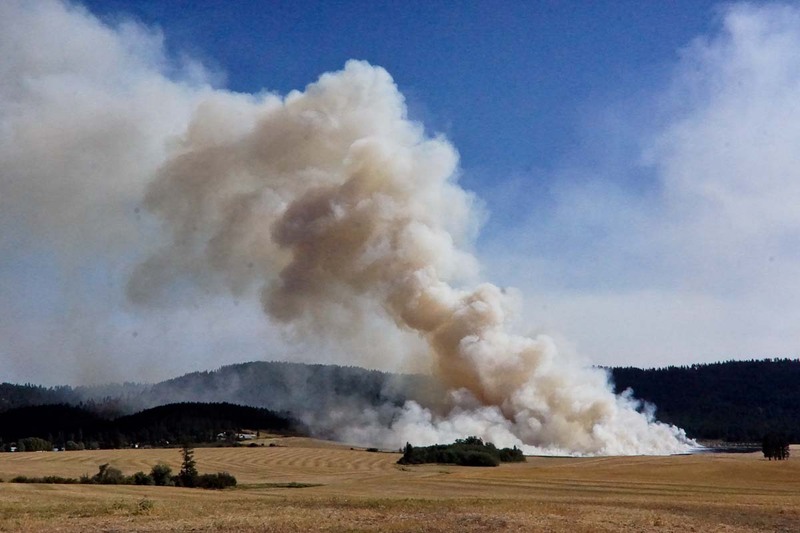 Just south of Spokane, the wheat country begins—rolling hills covered with huge fields—and I had heard, long ago, that those fields are sometimes burned to get rid of the stubble, and knew what the smoke was coming from. I tried to drive to the fires, but distances are tricky in clear air—I drove into Idaho (not that far) but couldn’t seem to get close to any of the fires—roads kept twisting in the wrong directions, dead ending in casino parking lots, or barricaded to prevent access—but eventually I found a view of a fire about a mile away. I sat and watched as a small fire grew, then suddenly billowed in front of the wind—an unexpected gift. I struggle to think about the differences between the wildfires in Alaska and the wheat field stubble fire I just saw—one triggered by lightening, the other deliberately set, one bursting beyond containment, the other bounded by the soil carefully turned at the edge of the field. But I also think of the scene in the movie version of Out of Africa, when the servant comes to the bed of Isak Dennison, to announce “I think that you had better get up, Munsab, I think that God is coming”—his way of announcing that a fire was destroying the coffee mill, and that her time in Africa was ending. Has my time in Alaska ended? I don’t know. When Karen Blixen traveled to Africa in 1910, travel was by steam boat and rail—the journey required days if not weeks to complete—I’m still only a few hours jet ride away from the country I’ve come to know and love. But I know, for now, my home is elsewhere. As Thoreau said, “I dwell in civilization again”. Your decision to move comments come very close to my own thoughts. I will be 70 in a couple of months and have lived in Alaska for 37 years now. I value your thoughts on this. Your comments on your move are well put and I think along the same lines. I was curious about what was up with your transition, it sounds positive. The common thread with so many of us in Alaska is that the dark winters have an increasingly pronounced effect on us.